Background: Many adolescent mothers experience significant challenges in regulating emotions due to adverse life experiences, which can place adolescent mothers and their children at risk for poor developmental outcomes. Ambulatory monitoring of stress that also provides immediate feedback using wearable biosensors has the potential to enhance clinician-delivered parenting interventions and help young mothers develop emotion regulatory skills. Methods: We conducted a pilot study to assess the acceptability, ease of use, and preliminary efficacy of a wearable biosensor, the iCalm sensor band, among a sample of four mothers, ages 15-18 years. Mothers wore the biosensor for a period of 24-36 hours while engaging in normal, daily tasks (e.g. caring for their child, attending school). Both quantitative electrodermal activity (EDA) data (via the iCalm sensor band) and qualitative data (via individual semi-structured interviews) were collected. Results: The adolescent mothers were able to comfortably use and wear the iCalm sensor band. EDA data were collected and corresponded with stressful daily life events described by the mothers during qualitative interviews. Conclusion: The iCalm biosensor is acceptable to use among high-risk adolescent mothers and appears to help mothers with the development of emotion regulatory skills. Many adolescent mothers experience significant challenges to effective parenting as they experience high levels of stress due to poverty, school problems and single parenthood and are more likely to come from disenfranchised Latina and African-American racial/ethnic communities.1Centers for Disease Control 2011, “National Vital Statistics Report: Births, Final Data for 2009 (vol. 60, no. 1)”.,22. Winters, LI & Winters, PC 2012,“Black teenage pregnancy: A dynamic social problem”. SAGE Open, published online. Adolescent mothers who enter parenthood with their own early histories of child maltreatment and mental health problems are particularly vulnerable and at great risk for maltreating their young children as these early stressors compromise their ability to effectively regulate their emotions and engage in sensitive and responsive parenting.3-63. Oxford, ML, Gilchrist, LD, Gillmore, MR,&Lohr, MJ 2006, “Predicting variation in the life course of adolescent mothers as they enter adulthood.” Journal of Adolescent Health, vol. 39, no. 1, pp. 20-26. 4. Valentino, K, Nuttall, AK, Comas, M, Borkowski, JG,&Akai, CE 2012, “Intergenerational continuity of child abuse among adolescent mothers: authoritarian parenting, community violence, and race.” Child Maltreatment, vol. 17, no. 2, pp. 172 – 181. 5. Ruedinger, E & Cox, JE 2012, “Adolescent childbearing: consequences and interventions.” Current Opinionin Pediatrics, vol. 24, no. 4, pp. 446 – 452. 6. Coyne, CA & D’Onofrio. BM 2012, “Some (but not much) progress toward understanding teenage childbearing: a review of research from the past decade.” Advances in Child Development and Behavior, vol. 42, pp. 113 – 152. Clinician-led parenting interventions have garnered some evidence for increasing positive parenting skills among young mothers, although intervention effects may be difficult to sustain in the long term.7Leonard, N, Laitner, C, Casarjian, B, Casarjian, R, Tottenham, N, Gwadz, M, Cisse, C,&Soloman, E 2012, “A mindfulness-based parenting intervention for at-risk adolescent mothers: Results of a pilot study.” Poster session presented at the Biennial Meeting of Society for Research on Adolescence, Vancouver, BC, Canada. Adolescent mothers with emotional regulatory difficulties typically find it challenging to effectively utilize the parenting skills learned in an intervention, particularly in moment-to-moment emotionally-charged interactions with their children. Mobile health technologies that provide ambulatory monitoring of physiological markers of stress such as heart rate and sympathetic nervous system (SNS) activity have enormous potential to improve emotional regulatory abilities via immediate biofeedback mechanisms.8-118. Horvath, T, Azman, H, Kennedy, GE, & Rutherford, GW 2012, “Mobile phone text messaging for promoting adherence to antiretroviral therapy in patients with HIV infection.” Cochrane Database of Systematic Reviews, vol. 14, no. 3, CD009756. 9. Poh, M, Swenson, NC,&Picard, RW 2010 “A wearable sensor for unobtrusive, long-term assessment of electrodermal activity.” IEEE Transactions on Biomedical Engineering, vol. 57, no. 5, pp. 1243-1252. 10. Bonato, P May/June 2003, “Wearable sensors/systems and their impact on biomedical engineering.” IEEE Engineering Medicine and Biology Magazine, vol. 22, no. 3, pp. 18-20. 11. Miklowitz, DJ, Price, J, Holmes, EA, Rendell, J, Bell, S, Budge, K, et al 2012, “Facilitated integrated mood management for adults with bipolar disorder.” Bipolar Disorders, vol. 14, no. 2, pp. 185 – 197. Unobtrusive, wearable sensors that provide continuous, real-time physiological monitoring can assist individuals to assume responsibility for self-care behaviors by increasing their awareness of phasic changes in these key biomarkers.8Horvath, T, Azman, H, Kennedy, GE, & Rutherford, GW 2012, “Mobile phone text messaging for promoting adherence to antiretroviral therapy in patients with HIV infection.” Cochrane Database of Systematic Reviews, vol. 14, no. 3, CD009756, 11-1311. Miklowitz, DJ, Price, J, Holmes, EA, Rendell, J, Bell, S, Budge, K, et al 2012, “Facilitated integrated mood management for adults with bipolar disorder.” Bipolar Disorders, vol. 14, no. 2, pp. 185 – 197. 12. Fletcher, RR, Dobson, K, Goodwin, MS, Eydgahi, H, Wilder-Smith, O, Fernholz, D et al 2010, “iCalm: wearable sensor and network architecture for wirelessly communicating and logging autonomic activity.” IEEE Transactions on Information Technology in Biomedicine, vol. 14, no. 2, pp. 215 – 223. 13. Choi, J, Ahmed, B,&Gutierrez-Osuna, R 2012, “Development and evaluation of an ambulatory stress monitor based on wearable sensors. IEEE Transactions on Information Technology in Biomedicine, vol. 16, no. 2, pp. 279-286. However, few have been evaluated outside of the original development phase. Electrodermal activity (EDA), commonly known as galvanic skin response, reflects the electrical conductance of the sweat glands in the skin and is driven by metabolic, cognitive, and emotional processes.14-1614. Critchley, HD 2002 “Electrodermal responses: what happens in the brain,” Neuroscientist, vol. 8, pp. 132 – 142. 15. Boucsein, W 2011, Electrodermal Activity: 2nd Edition. Springer, New York. 16. Moncada, ME & de la Cruz, J 2011 “Electrodermal activity – A review.” Ingenieria e Investigacion, vol. 31, no. 2, pp. 143 – 151. EDA exclusively measures SNS activity whose general action is to mobilize the body’s response to emotional arousal.14-1614. Critchley, HD 2002 “Electrodermal responses: what happens in the brain,” Neuroscientist, vol. 8, pp. 132 – 142. Under relatively low levels of physical exertion, higher EDA reflects emotional arousal, including arousal not open to conscious awareness. EDA is also elicited by attention demanding tasks17Bradley, MM&Lang, PJ 2000, ‘Measuring emotion: behavior, feeling, and physiology’ in Lane, R&Nadel, L (eds). Cognitive Neuroscience of Emotion. Oxford Univeristy Press, Oxford, pp. 242 – 276. such as parenting. Traditionally, EDA has been measured in the laboratory under simulated emotionally arousing conditions. In contrast, the iCalm sensor band is a portable, convenient and validated method of ambulatory monitoring of EDA.9Poh, M, Swenson, NC,&Picard, RW 2010 “A wearable sensor for unobtrusive, long-term assessment of electrodermal activity.” IEEE Transactions on Biomedical Engineering, vol. 57, no. 5, pp. 1243-1252.,12Fletcher, RR, Dobson, K, Goodwin, MS, Eydgahi, H, Wilder-Smith, O, Fernholz, D et al 2010, “iCalm: wearable sensor and network architecture for wirelessly communicating and logging autonomic activity.” IEEE Transactions on Information Technology in Biomedicine, vol. 14, no. 2, pp. 215 – 223. The iCalm sensor10Bonato, P May/June 2003, “Wearable sensors/systems and their impact on biomedical engineering.” IEEE Engineering Medicine and Biology Magazine, vol. 22, no. 3, pp. 18-20 connects wirelessly to an Android based Smartphone, which graphically displays changes in EDA in real time. The goal of this study is to pilot test the acceptability, ease of use, and preliminary efficacy of the iCalm sensor band among at-risk adolescent mothers. This study has two primary aims: 1) to explore to the validity of the iCalm sensor band and Smartphone to detect SNS activation among a highly vulnerable population of adolescent mothers parenting young children in an uncontrolled setting; 2) to examine the usability, ease of delivery, and acceptability of the iCalm device among these vulnerable youth. We recruited a sample of four adolescent mothers attending a high school for students primarily from low-SES families and highly at-risk for school dropout based on early school or social problems. Mothers were Latina and African-American between the ages of 15-18 years and were raising young children between the ages of 12-48 months. Mothers previously participated in a thirteen session group-based intervention that focused on increasing positive parenting and emotional regulatory skills through mindfulness parenting and cognitive-behavioral skill building.18Casarjian, B 2009. “Power Source Parenting: Growing Up Strong and Raising Healthy Kids.” Approximately one month after completion of the behavioral intervention, the adolescent mothers agreed to wear the iCalm sensor band and use the corresponding Smartphone for a period of 24-36 hours. Mothers signed informed consent, or if under 18, informed assent and parental consent. All procedures were approved by the New York University Institutional Review Board and the school administrators. The iCalm sensor band (see Figure 1) applies a constant voltage to the skin through two Ag/AgCl metal electrodes and measures the resulting current.9Poh, M, Swenson, NC,&Picard, RW 2010 “A wearable sensor for unobtrusive, long-term assessment of electrodermal activity.” IEEE Transactions on Biomedical Engineering, vol. 57, no. 5, pp. 1243-1252.,12Fletcher, RR, Dobson, K, Goodwin, MS, Eydgahi, H, Wilder-Smith, O, Fernholz, D et al 2010, “iCalm: wearable sensor and network architecture for wirelessly communicating and logging autonomic activity.” IEEE Transactions on Information Technology in Biomedicine, vol. 14, no. 2, pp. 215 – 223. A transconductance amplifier is used to convert the current to a voltage, which is sampled at rate of 4 Hz using a 12-bit analog-to-digital converter and then integrated into the sensor band microcontroller (Atmel XMega32A4). The sensor band also contains a low-power 3-axis accelerometer and temperature sensor, which are also sampled at the same rate. These additional sensors measure physical activity and help inform the interpretation of the EDA signal, which can depend on physical movement (metabolic activity) and changes in temperature (sweating). The iCalm sensor band has been validated against gold-standard laboratory measures of EDA9Poh, M, Swenson, NC,&Picard, RW 2010 “A wearable sensor for unobtrusive, long-term assessment of electrodermal activity.” IEEE Transactions on Biomedical Engineering, vol. 57, no. 5, pp. 1243-1252.,12Fletcher, RR, Dobson, K, Goodwin, MS, Eydgahi, H, Wilder-Smith, O, Fernholz, D et al 2010, “iCalm: wearable sensor and network architecture for wirelessly communicating and logging autonomic activity.” IEEE Transactions on Information Technology in Biomedicine, vol. 14, no. 2, pp. 215 – 223. and is currently under evaluation in two clinical trials.19Fletcher, RR, Tam, S, Omojola, O, Redemske, R& Kwan, J 2011, “Wearable sensor platform and mobile application for use in cognitive behavioral therapy for drug addiction and PTSD.” Conference Proceedings for IEEE Engineering in Medicine and Biology Society, pp. 1802-1805. The EDA data with millisecond time stamps are streamed in real-time to an Android-based mobile phone via Bluetooth. An integrated 600 mAh Lithium polymer battery provides approximately 12 hours of continuous streaming to the phone. (Alternatively, a 2GB micro-SD card can be used without Bluetooth extending battery life). The casing of the iCalm sensor band is made of neoprene, which is washable and water resistant, and can be worn on the wrist or the ankle.12Fletcher, RR, Dobson, K, Goodwin, MS, Eydgahi, H, Wilder-Smith, O, Fernholz, D et al 2010, “iCalm: wearable sensor and network architecture for wirelessly communicating and logging autonomic activity.” IEEE Transactions on Information Technology in Biomedicine, vol. 14, no. 2, pp. 215 – 223. The Android phone software algorithm monitors the slope, normalizes the threshold and integrated response within a ten second time window, and is graphically displayed on the phone. The cost to produce the iCalm sensor band is approximately $400, although it is not yet commercially available. At the start of the data collection period, a research assistant (RA) spent 15-20 minutes training each participant on using the sensor band and Smartphone. Participants were instructed to wear the sensor band and use the corresponding Smartphone for “as long as they could wear it” over a 24-36 hour period. Three participants chose to wear the ankle band. The adolescent mothers were instructed to take off the sensor band while bathing but could leave it on during sleep. At the end of the data collection period, the RA assisted participants in charting their activities by time period and their corresponding EDA. A semi-structured qualitative interview was also conducted which assessed acceptability regarding comfort and usefulness of the devices, ease of long-term use, and recommendations for future design. Quantitative Data – EDA data from the iCalm sensor band were exported into Microsoft Office Excel. Over 50,000 unique data points were collected for each mother across the 24-36 hour period. Both tonic EDA (reflecting slow adaptation to a stimulus or stressful event) and phasic EDA (reflecting rapid adaptation to a stimulus or stressful event) were captured. Accelerometer data were used to account for large phasic EDA signals that might have been confounded by bursts of physical activity or other such movements. Prior to analysis, large EDA signals were rejected that might have occurred during episodes of vigorous movement. Because the baseline EDA values differ from one individual to another, the data were normalized based on minimum and maximum values. The time series data were then plotted (Figure 2) along with the corresponding EDA values using custom software written in MATLAB (v. R2011b). Qualitative Data– The qualitative data were transcribed and reviewed in detail. Participants’ activities and stressful incidents were linked to the log of EDA over the data collection period. Themes were identified and data speaking specifically to the acceptability and ease of use of the sensor band and Smartphone application were highlighted. The four adolescent mothers each wore the band over a 24-36 hour period, taking the band off to bathe and sleep. 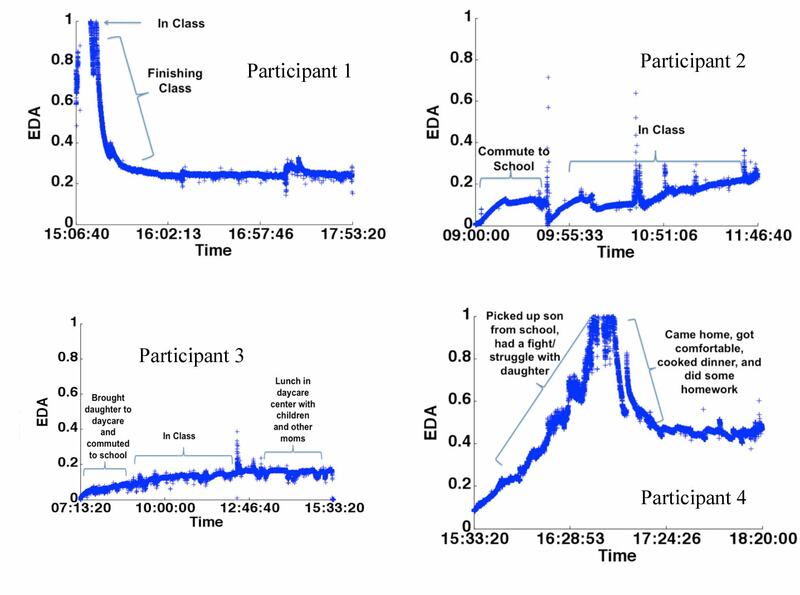 In Figures I-IV, we present representative samples of EDA activity for all four study participants, highlighting specific events, cognitions, or feelings that were associated with fluctuation in EDA. Time periods spanning approximately 3-5 hours were selected to best illustrate changes in the EDA observed across the four young mothers. The figures illustrate that the iCalm accurately captured variations in phasic and tonic EDA levels as participants engaged in their daily activities. While the tonic levels are due to multiple physiological and environmental factors, the phasic component corresponded with specific events associated with emotional arousal.20Wilhelm, FH&Grossman, P 2010, “Emotions beyond the laboratory: theoretical fundaments, study design, and analytic strategies for advanced ambulatory assessment.” Biological Psychology, vol. 84, no. 3, pp. 552 – 569. Large increases in the EDA signal corresponded to the perceived severity of stressful situations as described by the participants during the qualitative interview. Participants all stated that they were able to wear the iCalm sensor band as instructed. There were no side effects or social harms (e.g. peer-related stigma) reported. The mothers also provided suggestions for making the iCalm sensor band more comfortable and “fashionable” regarding the size and the quality of the material of the band. Barriers to use were identified primarily with regard to the comfort-level of the band itself when worn on the ankle under shoes or boots. All the mothers indicated that they would recommend the iCalm sensor band to other young people like themselves. The results of this study demonstrate that the iCalm sensor band was effective in detecting levels of emotional arousal among at-risk youth in an uncontrolled non-laboratory environment. Further, this study provides strong initial support for the usability of the iCalm sensor band among at-risk adolescent mothers parenting young children. 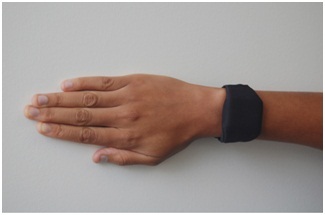 Results also support a high degree of acceptance and self-reported efficacy of the iCalm sensor band for monitoring and regulating stress in this vulnerable population. This pilot study indicates that continuous ambulatory monitoring of stress using the iCalm sensor band holds great promise for helping adolescent mothers to autonomously adopt previously learned emotional regulatory skills. Several possible limitations should be noted. The use of a small convenience sample and lack of a comparison group limits generalizability. While all the adolescent mothers who were approached for participation agreed, they may not be representative of all at-risk adolescent mothers. In addition, the high level of acceptability among participants could be due to the novelty of the technology. Moreover, the extremely brief period of time that participants wore the sensor band limits our understanding of the long-term use of the technology including issues related to charging the sensor band and loss or damage. While it is possible that the phasic EDA signals corresponded to bursts of physical activity, the inclusion of the accelerometer reduces this possible confound. Nevertheless, large spikes in EDA activity were omitted prior to analysis of the data. In addition, our qualitative data indicated that participants’ phasic EDA signals corresponded to specific stressful events and time of day described in the qualitative interview. While none of the study participants expressed concern about a loss of signal detection from the sensor band, the qualitative interview did not specifically ask participants about this issue. Although participants were instructed to observe the Smartphone regularly, data were not collected on how often participants observed their EDA. In our current clinical trials we are continuously monitoring participants’ use of the iCalm sensor band and Smartphone application through a web-based portal and collecting qualitative data regarding signal detection and the frequency of EDA observation. Future development efforts may include a component to alert the wearer that the sensor band is loose, not attached, or has been affected by a confounding variable (e.g., water). Future research efforts will involve incorporating intervention material, such as text, audio, and video-based emotional regulatory skills and parenting strategies into the Smartphone application for mothers to access once their EDA reaches an individually-determined threshold. In conclusion, the iCalm sensor band is highly acceptable among at-risk adolescent mothers and can assist mothers to utilize previously learned emotion regulatory skills during real-life stressful moments. This pilot study demonstrates that the iCalm sensor band has the potential to expand the reach of clinician-delivered parenting and other behavioral interventions. This study was funded by the New York University College of Nursing Center for Drug Use and HIV Research (CDUHR, NIDA P30 DA011041P30) and the National Institute of Drug Abuse (Principal Investigators: Leonard, N.R. & Gwadz, M.V, NIDA 1R34DA03296 “Integrating Behavioral Skills with a Mobile Biosensor for At-Risk Teen Mothers”). Support for Dr. Rajan was provided by the Behavioral Science Training in Drug Abuse Research Program (Public Health Solutions of New York City and NDRI, Inc. (NIDA T32 DA07233). The authors would also like to thank Jiahui Carrie Liang at the Massachusetts Institute of Technology for her contributions and assistance with the data analysis. Centers for Disease Control 2011, “National Vital Statistics Report: Births, Final Data for 2009 (vol. 60, no. 1)”. Retrieved online [http://www.cdc.gov/nchs/data/nvsr/nvsr60/nvsr60_01.pdf#table07]. Winters, LI & Winters, PC 2012,“Black teenage pregnancy: A dynamic social problem”. SAGE Open, published online. Oxford, ML, Gilchrist, LD, Gillmore, MR,&Lohr, MJ 2006, “Predicting variation in the life course of adolescent mothers as they enter adulthood.” Journal of Adolescent Health, vol. 39, no. 1, pp. 20-26. Valentino, K, Nuttall, AK, Comas, M, Borkowski, JG,&Akai, CE 2012, “Intergenerational continuity of child abuse among adolescent mothers: authoritarian parenting, community violence, and race.” Child Maltreatment, vol. 17, no. 2, pp. 172 – 181. Ruedinger, E & Cox, JE 2012, “Adolescent childbearing: consequences and interventions.” Current Opinionin Pediatrics, vol. 24, no. 4, pp. 446 – 452. Coyne, CA & D’Onofrio. BM 2012, “Some (but not much) progress toward understanding teenage childbearing: a review of research from the past decade.” Advances in Child Development and Behavior, vol. 42, pp. 113 – 152. Leonard, N, Laitner, C, Casarjian, B, Casarjian, R, Tottenham, N, Gwadz, M, Cisse, C,&Soloman, E 2012, “A mindfulness-based parenting intervention for at-risk adolescent mothers: Results of a pilot study.” Poster session presented at the Biennial Meeting of Society for Research on Adolescence, Vancouver, BC, Canada. Horvath, T, Azman, H, Kennedy, GE, & Rutherford, GW 2012, “Mobile phone text messaging for promoting adherence to antiretroviral therapy in patients with HIV infection.” Cochrane Database of Systematic Reviews, vol. 14, no. 3, CD009756. Poh, M, Swenson, NC,&Picard, RW 2010 “A wearable sensor for unobtrusive, long-term assessment of electrodermal activity.” IEEE Transactions on Biomedical Engineering, vol. 57, no. 5, pp. 1243-1252. Bonato, P May/June 2003, “Wearable sensors/systems and their impact on biomedical engineering.” IEEE Engineering Medicine and Biology Magazine, vol. 22, no. 3, pp. 18-20. Miklowitz, DJ, Price, J, Holmes, EA, Rendell, J, Bell, S, Budge, K, et al 2012, “Facilitated integrated mood management for adults with bipolar disorder.” Bipolar Disorders, vol. 14, no. 2, pp. 185 – 197. Fletcher, RR, Dobson, K, Goodwin, MS, Eydgahi, H, Wilder-Smith, O, Fernholz, D et al 2010, “iCalm: wearable sensor and network architecture for wirelessly communicating and logging autonomic activity.” IEEE Transactions on Information Technology in Biomedicine, vol. 14, no. 2, pp. 215 – 223. Choi, J, Ahmed, B,&Gutierrez-Osuna, R 2012, “Development and evaluation of an ambulatory stress monitor based on wearable sensors. IEEE Transactions on Information Technology in Biomedicine, vol. 16, no. 2, pp. 279-286. Critchley, HD 2002 “Electrodermal responses: what happens in the brain,” Neuroscientist, vol. 8, pp. 132 – 142. Boucsein, W 2011, Electrodermal Activity: 2nd Edition. Springer, New York. Moncada, ME & de la Cruz, J 2011 “Electrodermal activity – A review.” Ingenieria e Investigacion, vol. 31, no. 2, pp. 143 – 151. Bradley, MM&Lang, PJ 2000, ‘Measuring emotion: behavior, feeling, and physiology’ in Lane, R&Nadel, L (eds). Cognitive Neuroscience of Emotion. Oxford Univeristy Press, Oxford, pp. 242 – 276. Fletcher, RR, Tam, S, Omojola, O, Redemske, R& Kwan, J 2011, “Wearable sensor platform and mobile application for use in cognitive behavioral therapy for drug addiction and PTSD.” Conference Proceedings for IEEE Engineering in Medicine and Biology Society, pp. 1802-1805. Wilhelm, FH&Grossman, P 2010, “Emotions beyond the laboratory: theoretical fundaments, study design, and analytic strategies for advanced ambulatory assessment.” Biological Psychology, vol. 84, no. 3, pp. 552 – 569.